Ever since college, I’ve been planning for my financial future. The path was always pretty straight forward – get a job I hopefully like, don’t fall into the consumerism trap, stay in shape to not die young, save as much money as possible, work hard, get rich, and retire. But one thing happened I did not anticipate. The internet started becoming more mainstream. I’m part of the generation that knew what life was like before the internet and smartphones. As a result, I very much appreciate how much better life is now with the internet! Starting your own website is a no-brainer. Let me share with you so many reasons why. We tend to only do things when there’s enough agitation to change. For me, I felt like working at an non-ideal job was like a test of endurance. Originally, I thought I’d be able to last 18 years until the age of 40. But I failed. Instead, I harnessed the internet to start this site in 2009 because I needed an outlet. I never anticipated just running a website would allow me to be completely free, but it has. If you’ve been reading Financial Samurai for at least a couple years, you’ve witnessed the progression as I’ve been pretty open during the journey. Here’s what you could potentially do if you started your own site. 1) Connect with new people in a tailored fashion. The internet is all about connecting with people who share your common interest from all over the world. You can make new friends with people all over like I’ve done since 2009. There are literally dozens of people scattered around the world whom I can grab a meal with or stay with during my travels. Having a community of friends can help you better achieve your goals. You’ll still need to go out there and meet people in real life, but the social aspect is pretty wonderful once you’ve found your people. 2) Do what you love. Once you have a website, you’re free to test the platform out on things you love. There are sites about music, cars, sneakers, movies, electronics, travel, food, dating, fitness, real estate, and money that have gone on to create large audiences because it is evident the owner loves what s/he is doing. I love to write finance-related articles without compliance committee oversight. I love to come up with an idea, formulate a plan, execute, and watch the idea grow. Having your own website allows you to test out so many things without much downside. 3) Make a little or a lot of money. Creating a large enough site that makes you at least $1,000 a month takes work – at least a year for most people. But as you can see from the millions of sites out there, it can be done! Start with a smaller goal, like making $100 a month, and work your way up. Remember, if you can create a $10,000 a year additional income stream, that’s equivalent to owning a $400,000 asset that yields 2.5%. A website is scaleable, costs little to run, and is very low maintenance. Compare an online business to a bricks and mortar retail store and there is no comparison! Income upside is unlimited! 4) Legitimize the existence of your new business. You can tell people you’ve started your own business, but if you’ve got nothing to show for your business, does it really exist? Since you’re not down to spend thousands of dollars a month on office overhead, the easiest and cheapest way to establish your business is to establish your site online. You’ve now got a virtual place for everyone to go to check out your product or service. Once you’ve set up your business online, you’ll discover a myriad of ways to earn money, save on taxes, help loved ones, and blend work and fun much easier. 5) Leave a job you no longer enjoy. In 2012, at the age of 34, I negotiated a severance from a job that no longer interested me after 13 years. It’s been four years since I’ve last had to report to anybody, do something I didn’t want to do, play office politics, and endure an unpleasant rush hour commute. Not a day goes by where I don’t thank my lucky stars for having freedom. Financial Samurai was the main reason why I had the courage to leave. I had something fun to do that had some momentum. I just didn’t know how far I could really take it. 6) Own your own brand online. The reason why sites like LinkedIn, Facebook, Twitter, etc have grown so large is because millions of people have decided to create their brand on their platforms. Instead of playing by another website’s rules and enriching them, why not play by your own rules and enrich yourself? When someone Googles your name, it’s much better to have your branded site pop up first rather than LinkedIn. Have both if you must, but definitely have your own at the very least so you can tell your desired story. 7) Get a new job more easily. Every single employer Google’s your name before they hire you. If you are one of the very few people who have their own branded website vs. just a LinkedIn profile, you will instantly stand way above your competition. I’ve been able to get consulting gigs at four financial technology companies with relative ease because they recognize my work on FS. I know plenty of examples where individuals who’ve carved out their little niche have gone on to get plum jobs at places like AirBnB and Uber. A potential employer will see creativity, hustle, and initiative from those who’ve spent the time to create their own site. A website looks fantastic on your resume. 8) Learn how to hustle and sell. There is no better “sink or swim” test than starting your own site. To get people to visit, you’ve got to build relationships with other influencers in your niche, write good content worth reading, create a product worth buying, guest post, leave comments, and do things differently. If you don’t, nothing much really happens, or the growth you were hoping for doesn’t materialize. There’s no better way to learn than by doing. The great thing is, if you fail, it’s OK, especially if you are side hustling. You simply try again. 9) Easily help others. People often wonder how they can better give back to society, especially if they don’t have much money to spare. I firmly believe all of us have some knowledge to give that will help others avoid pain, suffering, or wasted time if we take the time to share our experiences. If you have a website, you can share your knowledge with anybody who wants to listen. Google will help those seeking your help find your content. There’s no need to game the search engines because Google has had a decade to perfect their search results. 10) Focus on what you can control. With the stock market laying an egg in the beginning of 2016, net worths around the world are getting crushed, and there’s not much anybody can do about it. I wrote in my 2016 goals and predictions post that I expect a $300,000 drop in my net worth due to my holdings in stocks and real estate. But I still plan to increase my net worth by $500,000 through aggressive savings, more conservative investments, and most of all, through my work ethic with Financial Samurai. I know with high certainty that if I write more I’ll garner more traffic. With more traffic comes higher revenue. Being able to do things that can positively affect your future is one of the best feelings ever. Do not simply accept your situation with no way out! 11) Free swag. Are you ever amazed by how much swag attendees at the Oscar’s get? Supposedly, the latest goody bag for 2016 is valued at over $200,000! Well guess what? Your dear author also gets some pretty amazing free swag as well. Most recently, I got a $800 free Fluidstance level balance for those who like to work standing up. If you start a site with a good reputation, you’ll also be approached with a lot of free offers. If you love to read books, you can build a whole library of books for free from authors who hope you’ll promote their stuff! 12) Crowdsource knowledge. I’m always looking to invest in commercial real estate around the country to diversify my real estate and investment holdings. What better way to make more informed investment decisions than to take the collective wisdom from your website’s community and synthesize the information? Here’s a good example of crowdsourcing knowledge where I asked the community to share their thoughts on Conshy, Pennsylvania. The insights in the comments section are pretty amazing! 13) Leave a legacy. I’ve never thought about my legacy, but those who’ve gone through mid-life crises or who are older have consistently told me about their desire to leave a legacy. They worry about what other people will say, or whether they’ve contributed enough to society to make themselves and their family members proud. I guarantee you that if you do what you love every day while helping others along the way, you will leave a fantastic legacy you will be proud of. It is incredibly satisfying to help someone without an expectation of anything in return. For those of you who’ve only known the internet, I’m not sure you appreciate how good you’ve got it. Us older folks used to have to go to the library to research information and painfully reference each source and wait for results. Nowadays, everything is instantaneous. Thus, it would be a missed opportunity if the internet generation did not fully leverage the web and create their own websites. 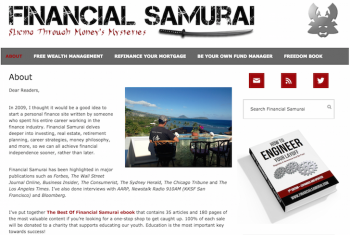 FinancialSamurai.com is my X Factor for financial freedom because from 1999 – 2012, I prepared for my exit by methodically creating my Passive Income Portfolio. My online income is a byproduct of sharing my journey towards financial freedom. I never anticipated that what I’ve been writing about these last seven years could morph into a meaningful online income. You can register your domain for under $20/year and get hosting for $2.95/month through BlueHost within a couple minutes. You’ll also get a free domain name for a year. Connect your WordPress site (what I use) with your domain and host to get started. That’s what I did when I first started seven years ago. Click here to follow a step-by-step guide on how to launch your own site in under 30 minutes. Every day, I’m thankful for the internet. It has allowed me to break free and live life on my own terms. Along the way, I’ll continue to have setbacks. But at least I know that worst case scenario, I’ve got Financial Samurai and my passive income to fall back on. 1). It is easy to start a blog/website but it is very hard to maintain and keep it going FOR MONTHS and YEARS consistently. If you are not sure you could do it AND if you still want to succeed my advice would be the following: think of something that you have enjoyed doing for many many years? What is it? If it is gardening – then here is your answer – start a website about gardening. Do you like cooking? Have you been collecting recipes for years? Again – this is where your passion lies and this is what will keep you going. Create a website about cooking and I guarantee you won’t get burned out after several months of blogging and little to no visitors. 2). It is a statistical fact that the most profitable niches/websites are about ‘how to make money’, health and beauty, and relationships-dating. These 3 niches are highly competitive niches but are also very profitable. 4) Consider your personality. I find that it is easier to be an extrovert to succeed online. Here is the thing: to be successful with your website you need’ll to be 4 of these 1) A good writer (to produce content) 2) An IT person to handle technical issues with your website 3) A marketing specialist to understand how to market your content. 4) An eye for detail and have a sense of colors/styles etc. This is to make your website looking food. Failing in any of these will delay your results. I am already failing the #3 – marketing – because honestly I am tired of knocking on closed doors. I have contacted so many ‘right people’ and popular bloggers to only get silence in return. I am done with this. I’ll keep focusing on creating my website, keep it look beautiful, no annoying ads and if someone finds me and likes what they read – fine, if not oh well. Having a website is a life long journey. It will test your character, your level of commitment, devotion, persistence, and endurance. To succeed you will have to keep going when it feels like no one EVER reads what you write or like you are about to give up. It is a painful, lonely road to travel and all bloggers went through it. Remember these words when it feels hopeless. It will work out if you just stick with it. Thanks for reading. Been following your blog since last August, and I just decided to start mine because of your posts on blogging. Thanks for all the great content! Sam, thanks for all the great FREE content. You have inspired me start my own website/blog. I think the key for me is that I love to teach, but I am quickly becoming fed up with the way the education system is heading. I will stay and fight as long as I can, but I also realize that I may have to transition one day. Thanks for all the great advice on this site and keep writing about tennis! (I’m a coach for a high school here in the midwest and it is great to “know” a 5.0 USTA player! Congrats!). Thanks for the inspiration, I went and did it and started a site: fitsaving.com!! Now can you write a post on how to promote it?!?!?! No clue what I’m doing but I figured the best way to learn was to jump right in. Thanks again for the new adventure. Sure, but before I do, I want you to write 2-3 1,200 word posts a week without fail for 6 months and check back in! Yikes! I’m about a month in and thought I was doing pretty well with once a week and 1000 words. I guess I’m going to have to set the bar higher and become a more prolific writer. Either way, love your blog. I’ve been reading it for about a year and between you and MMM there is nothing better on the internet. Hey a quick comment from me, sitting-on-the-sidelines, I personally have enjoyed your experiences and commentary as an uber driver, these “side hustle’ experiments are valuable and entertaining as well !! Also fall into the category of “stealth Wealth’ where you get to observe regular, unenlightened, fellow humans in their natural habitat, which is useful research and fodder for other articles! How about some other side hustle type jobs-barista, waiter at an upscale restaurant, check in desk attendant at the gym (usually comes with a free membership-a tax free perk…) Thanks for all the useful content-we in the “millionaires next door club ‘enjoy it, although you would never guess it-we are too busy leading unassuming lives, and practicing the things you teach!! recently stumbled upon your website and I intend to become a regular visitor – you’ve got some great posts and it’s good to hear about someone else who has reached independence. On the website point, One of the things that i struggle with is the issue that there are already hundreds/thousands of people out there writing about finance, real estate, careers, hobbies etc and I guess I’m afraid of not generating enough interest. Though I suppose that’s part of the struggle. Any thoughts on over-coming some of that self-doubt? When I started Financial Samurai in 2009, I had the same thoughts. There are already MILLIONS of websites out there, why should mine be anything special? But, good things come to those who try for a long, long time. Don’t suffer from the syndrome where you don’t want to ask the pretty girl out b/c you think you have no chance. Success is a time and numbers game. Do some side hustling after your day job is over. Work on it over time and take calculated risks. I took my leap of faith in 2012 about 2.6 years after I started FS. It has been a great ride, and I have another “trick” up my sleeve in 2017! It is definitely a long term wait for the results type of proposition. Don’t get your hopes up that in one month you will have $1000’s of dollars of passive income, it will take time to build the content. If it is truly valuable content the people will find it. Dreams of quick Money or get rich quick is a problem many people have, and they give up. Think about it like writing a book, you will not get rich the first chapter you write, it takes time to develop but once the hard work and effort are put in, eventually it should have its rewards. Solving people’s problems is a good approach, not everyone can write about. I’d appreciate your thoughts on niche selection. Is it OK to start a broad site if your interests are varied or do you think niching down to a single subject is still the best way to go? You’ve got to estimate the market opportunity and your ability to write continuously. Too niche, and you will burn out quickly. Wrong market, and you will never make any realy money. I have to start by saying thank you. This post along with a book I recently read – got me moving on my website idea and focusing my passive income stream. Although I have a way to go since it was January 2016 that I started the site, I am happy to say it has given me joy as well as the opportunity to reach financial freedom. For me my passion is the insurance industry, and although it may sound bizarre there is nothing more interesting to me as risk, risk transfer and insurance. I believe everyone should have their own websites, and focus on areas of their own expertise and interest. What might you suggest to someone with no web coding skills starting on a financial shoestring? You my friend have just inspired me! Today is day one of my journey. I know I have a long road ahead of me, but all the points you made above are valid. I love side income/passive income. For many years I have done the eBay/Craigslist thing, but I never thought about my personal brand or own website. Let’s see where I end up a year from now! Would love to read more about successful website/blogging from you. but have no clue about real estate and also don’t have the growing market as per SF that you are fortunate enough to be in…My question is…what do you think of p2Realestate investments like Patch of Land, etc. as opposed to owning and being ‘the landlord’ for income streams…. I’m so glad I have my own website. It takes discipline to stay consistently active but that’s pretty easy to do when you’re having fun. Sam you nailed it with everything in this one. It takes about a year to get it really going. I left my job at 6 months after I started M$M, but wouldn’t have made it if I hadn’t started doing digital marketing as well! It does slowly start to bring in cash though – last month (1 year after I started the blog) I made $2,900 in ad/influencer revenue. Be creative, pick a niche and provide value to people by giving them tools to solve problems! I really enjoy having my own website. It’s something that I thought of in kind of a “eureka” moment, but it does take consistent work to maintain it. Right now it’s kind of a hobby as I post sporadically, but I plan to take it to new heights this year. This website keeps giving me the motivation to keep at it! My biggest regret in terms of starting a blog is that I didn’t do this years ago. The idea just never came to me (I’m not computer-savvy and websites were for expert coders, in my mind. Plus I always thought that all these ads were viruses and stuff). I’ve always had my opinions on retail banking and the policies/customers/whatever, so I’m honestly surprised that Angry Retail Banker wasn’t around back in 2012 or something. It’s a great outlet for me to vent my never ending frustrations as well as help people that I could never help at my bank. Like you said, Sam, there’s no compliance officers (or bank managers or bank auditors) making rules about what I can or cannot say. I would recommend to any would-be blogger who is just starting out and wants to learn some of the ropes before taking the plunge to check out revenue-sharing sites. I’ve written for a couple, and you learn things like basic SEO, how to keep a posting schedule, how to find public domain photos, etc. Try to find a site that’s WordPress based; I learned how to post on WordPress through one of these sites before I ever dreamed of my blog. It’s worth trying for a little while, but ultimately you are going to want your own website. Now I’ve got to increase my posting frequency and drive more traffic to my blog. The problem these days is that it became a trend to have a website, but the majority of these people ignore how much real work and efforts it takes to come up and build a great website that makes real money, it is similar to the new year gym members who “which” to achieve a great shape, they quite after a few months, only those who deserve and put real and consistansy work will remain. Great and very informative blog BTW.! What are your views on creating a YouTube channel since both YT and blogging are examples of a lifestyle business? In the long run is a YT channel as profitable as a website? The issue is you don’t own the platform with YT, so will always be at there mercy (algorthym changes ect). This is a VERY important comment. Just a week or so ago a popular YT gun advocate with somewhere around 1.8 million subscribers was kicked off YT for some unknown reason. It was dicey for a day or so as they appealed and waited to see if they would be reinstated. They finally were, but they could have just as easily been denied. When you own your own site, you own it. When you own a popular YT channel, FB page, etc., you are at the mercy of the true owner’s plans, policies, whims, etc. Thanks for this timely post, I’m launching my financial blog aimed at 20-30yr olds in the UK this year! Watch this space! Great point on legacy. I started mine because I felt a need to share my experiences and help others. I read ALOT of books/blogs (yours is one of my favorites) so I felt I had to contribute in back in some way based on my investing experience (good and bad) rather than absorbing it all the time. Now I’m focused on consistently writing and figuring out how to use keywords, optimizing for seo.. Do you have goto resources for optimizing website so it comes up in searches? I’ve written a lot about SEO in the Yakezie.com archives. Google “SEO Yakezie” for the articles is probably easiest. I would enjoy such a post, but (at least to me) starting is not the hard thing. It is making sure to keep going and even more so, trying to make sure people will actually find it either interesting or useful (or both!). Thanks for the article! There are tons of these out there, yet I still learnt something new from your post. Leaving a legacy – I have never seen it that way, and it rings true. I personally like how the internet “forces” us to connect and provide value. There really is no way you can lean back and egoistically do “your thing”. Sometimes, the articles on my webpage that I personally think are great are the ones that get very little love, while other articles that I am much less happy with perform really well and get lots of visitors. So that forces me to reevaluate what to focus on in my writing. Having grown up in the pre-internet era, I really find the internet an incredible gift. A rare case where we can actually be aware of something great while we use it! I have read and spoke with so many people that are doing exactly the same things I want to be doing (leaving the 9 to 5, working for themselves, traveling and working). All of them say the same thing “you need to have your own website”. That’s exactly what I did and if I continue to share whats going on and producing great content then hopefully I can start freelancing and living the same life I see others living. That’s right Tyler. If you keep consistent, build relationships, guest post, you will surprise yourself one day with how much progress you’ve made. And when you do end up traveling somewhere, you will love the ability to run your website remotely as well. It is an awesome awesome feeling! I think you should do what you think will serve the greater good despite public opinion. It is statistically rare to achieve 98% voting results on any topic, and many of us would really appreciate your time and input. Perhaps reaching just one reader with your advice will eventually help many others in unforeseen ways. I update my Blogrolls every 1-3 months, and each time I’d have to drop somebody off my active list. Bloggers dropped out like flies. – WordPress charge to you “mapping fee”, which people assumed that it was free, it wasn’t that’s another $15/year. – You can’t make money with wordpress this way because they won’t let you putting your own code from adsense, and ban you from putting any type of commercials on you website. You don’t have any control. Someone who’s starting out, I only a very few people can get over 1000 hit/day ($6/day) in google earning. With that said, if you want to start a personal blog so you can keep track of your finance, post comment, and have a community, go for it. Just don’t waste tons of time trying to make money online. You can use that time to do real work to get a lot more money. I agree with the math but I disagree with the idea that you can’t make money online. And when you think about it, you can start a business with less than $100. Think about how absurd that sounds. Before the internet era, if you wanted to start any kind of business, the costs would be far more and you couldn’t get up and running within an hour. It’s a situation where a few people do really well and most people don’t. But the risk is so low. You also learn valuable skills along the way. I have programming and marketing skills. I started my Internet business over 10 years ago and it provided me with opportunities that were impossible without the Internet. Within 6 months I was able to make more than my parents, and it grew from there. I spent several months/year living in different countries and avoiding the winters. The beauty of the Internet is scale. At any given time there could be over a thousand people on my site, yet I might be sleeping or at the gym. A brick and mortar business requires constant maintenance and startup costs. I believe the startup costs for me were about $10 for a domain and $6/month in hosting. Even my “failed” websites still just sit there and collect a little money. Vivianne has some good points as I’ve run into the same issues with my blog. However, I think that while the initial investment may be prohibitive (and even that is kind of a stretch) the potential is immense. Like Jim said where else can someone begin a business with as little as $200? Great article and I hope that the step by step guide sees the light of day. 1. Having something unique to say that people are interested in. 2. Knowing what you’re talking about. 4. BOTH content and marketing. Then again, I’m new, so what do I know. :) I guess I’ll find out! I would add that you need to be an active visitor and regularly comment on other blogs. Also be someone who reads and shares other bloggers tweets, Facebook posts, etc. Blogger will return the favor and help you increase your traffic. Best of luck to you. Isn’t that nice? The online community is like the offline version. We go around and network, which is really making friends and establishing connections. The only difference to the “offline world” is that we have more access to people. I think Twitter is another good avenue where you can reach a lot of people at once when you respond to other users using one of the trending hash tags. If there are 25,000 people tweeting about one hash tag, that’s a lot of potential connections. I cannot emphasis #3 more. The key to success online really starts with sticking to it. Problems will come up and you skills will improve, no one is perfect right away, work work work and keep working to improve and and learn. I understand your frustration. Let me say, though, a large portion of your problems can be solved by using a self-hosted WordPress (wordpress.org) site as opposed to WordPress.com. WordPress.COM does not allow monetization, unless they deem you worthy and you get personally invited. I didn’t know anything about wordpress or blogging to begin with and simply signed up at wordpress.com. Only after a little research did I learn that wordpress.ORG gives you the complete freedom to make your site how ever you want it (ads included). I promptly switched. Sites like bluehost.com or siteground.com will easily get you going with a wordpress.org site. Hope that helps! Perfect post timing for me as I am just in the process of starting my own site. Learning lots and am excited about the opportunity. “A year from now you may wish you had started today”. I’ve been using that quote to motivate me and it’s helped quite often. I don’t want to waste a year, so I’m starting now!!! Yes indeed. Don’t ever regret having never tried. I am building my own site so I would be interested on your take on the subject. Especially your response to the critics of blogs as a source of income (Wall Street Playboys notably). They state that blogs are far less profitable than simply selling a product because blogs take a long time to start generating income. The operating profit for a blog can go up to 99% depending on size and how much you pay yourself. A product is also pretty good once you do the work. The key is to do the work. One of my goals is to release a new product every year. Things add up! This point was the biggest motivator for me in starting a website. I love the idea of the success/failure of my site being solely my responsibility. I’ve never been a fan of relying too heavily on others, and a website is one place where it’s clear that what I get out of it is the direct result of what I put in. BINGO! All I’ve ever wanted was a correlation with effort. Jobs can really do a poor job with meritocracy. With your website, you can compete with Yahoo or anybody. It is very fun and could lead to great things. Interesting post Sam. I have started and stopped a few websites over the years, the last one is still active but has not had any new content for a few months. I am now deciding whether to start posting on that site again or only devote my time to putting my content on another site I am creating for another side business I just started last month. Between my full time job, two side hustles and home improvement projects, I am trying to figure out if I have enough to create quality content consistently. If I do go ahead, I will send you a thanks for getting my rear in gear. You have recognized the biggest problem with growing a website: consistency. Perhaps writing about your side hustles is a good 1:2 combo? I look at all experiences as potential content on FS. My only regret on my website, which I’ve had since 2009, is that I didn’t start it sooner. I had thrown the idea around for two years, and of course many others beat me to the punch in the meantime. I still enjoy it tremendously! I hear you MB! My father was telling me about starting a site in 2003-2005, but I couldn’t be bothered due to going to business school part time. But there’s no better time to start like the present. It’s been a fun ride, hasn’t it? I started my own blog for basically all of the reasons you listed. I hope it pays off in the long run. In the short run it is a LOT of work, especially creating new, good content for the website. I’m sure I’ve put in at least 150-200 hours into it, and I’ve only been at it a few months. Just writing blog posts for it takes about 12 hours per week, which means I have no life right now between my regular attorney job, my all-day-Saturday tax work, and the blog. I also need to get faster at creating content, but like Sam, I think it’s important to make the blog posts good by including real information, statistics, references to outside sources, etc., and that takes time. It’s also a little frustrating and disheartening to write what you feel are very good, content-rich posts, and to have very few people read them. I’m going to stick with it for at least a year and see what happens. I don’t expect to be making huge cash flow from my blog at that point, but if I see steady viewership increase, then it will give me the motivation to keep going. Everything good takes a lot of work (https://www.financialsamurai.com/if-you-produce-nothing-how-can-you-expect-to-make-any-money/). To gain traction, you’ve first got to give, give, give. Link out to other sites. Sing their praises. Let them know you’ve done so. Write your best work on bigger platforms. Starting a site is a great exercise in being more altruistic. But I believe good things happen after a while b/c the universe always has a way of giving back. Yetisaurus – you’re me 5 years ago. Seriously, some of what you wrote is exactly what I did in my journal, especially the parts about being unsure if it’ll pay off and being discouraged when few people read. That means guest posts, interviews on existing podcasts, offering a free webinar for other sites’ subscribers… be proactive about getting in front of possible readers. (Don’t do what I did, which is just publish and hope readers will eventually find me – it took forever). You can also repurpose your existing content by reading it aloud, recording an MP3, and putting it up as a podcast. Read it into your webcam and record, then post it on YouTube. Same content, now findable on three different platforms without too much extra work. I’m so glad I stuck with my blog. Keep going – it’s worth it! Wow, I just reviewed your slides. Fantastic information! In the last 2 years I have begun seeing modest results from YouTube and my e-book sales. This inspires me to keep going! I’ve been reading your blog for almost a year now. I’m really thankful for the time and effort you put into this. First time I comment, but this topic very hot for me right now. I’ve been thinking about Personal Branding, which is more relevant to me at this time than generating cash. And here are a few questions I have. –> you remain anonymous on this site ( stealth wealth :) ). When it comes to personal branding or promoting yourself as a consultant, do you do that through another personal website (which of course I’m not asking you to disclose) or how do you manage to leverage an “anonymous” website as a personal brand? –> Your site has been up for more than 7 years. Congratulations. I can only imagine how hard it must have been at first, gathering an audience. What kept you going? It’s always nice to have international readers from Europe. I was in Bruges a couple years ago and loved it! 1) One of my biggest goals was to see if I could connect with people without a face. We all bring with ourselves all sorts of prejudices where we tend to see what we want to see, and believe what we want to hear. I thought, what a challenge, and how fun it would be to see if the quality of my writing could stand on its own. Personal branding was never a goal of mine when I first started. I wasn’t seeking attention about who I am as I enjoy my privacy. 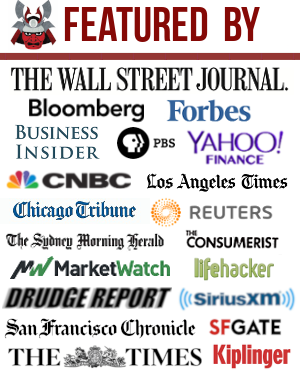 I was seeking like-minded folks who were trying to deal with the financial crisis like I was. When I left my job in 2012, I thought more about personal branding because I launched my book and wanted the option to do consulting work for other companies. But I didn’t seek to create a personal brand. The personal brand is simply what I believe in, who I am, and my writing. All I did was come up with a name, color scheme, layout, logo, and motto. Everybody’s personal brand is created through their actions. The longer you are around, the stronger your brand. I speak to and meet with people every week. I go to conferences to hang out with other folks in the space. Be congruent with who you really are. 2) Fun. Just think about this for a moment. I spent several hours writing and editing this post. Now I’m spending time writing a long response to you, and other people as well. How much do I earn from you? Probably $0. How much will I earn from others whom I respond to? Probably $0. In other words, I create and interact with others because it’s enjoyable. Nobody in their right mind would spend all this time if there wasn’t enjoyment. The money will come in the future, but not if you don’t enjoy what you’re doing. When it’s time to create your website and your personal brand, just reminder to consistently do what you enjoy doing. Once you put yourself out there, good things start happening. Thank you for another great post and interesting points Sam! The other unmentioned benefit to remaining faceless with your website is that you create a greater opportunity to sell your asset one day because it’s not directly linked to you. Respectfully, I disagree with your second point. In any profession where you position yourself to sell a product or service to another person, my belief is that it would be incorrect to directly place a financial value on your relationships. With that being said, I understand your point about building relationships with people who decide not to buy for whatever reason. I caution you on this thinking because those readers who do decide to buy will do so with emotion and subsequently will justify their decisions with value and logic. The interactions you create with your readers places them in a position to like and trust you and will become a reason why some decide to buy from you. Have you considered giving #2 a go and building a bigger site with lots of content? I can assure you that if you don’t love interacting and writing, you’ll quit within the first year. It’s a lot of work! “I caution you on this thinking” – Not sure what’s wrong with spending time to interact with people who never buy anything from me. Again, my main joy is communication. “incorrect to directly place a financial value on your relationships” – Not sure what these means either. B/c money is not the main objectives, there’s no need to place any monetary value on relationships. I’d love to get some clarification! And, I’d love to challenge you to write 2-3 posts a week. It’ll be fun, and we can challenge each other! I was concerned that you were placing a $0 value on your interactions/relationships with your readers. Perhaps this a misunderstanding on my part? That’s great that your motivation for interacting with your readers is because you enjoy it. I have personally purchased 2 products from you. One I needed, the other I gave to a friend because of the trust you have established with me for genuinely wanting to help people. I believe that my perceptions originated over time through your blog as well as the responses in the comments section of your blog posts. I’m sure I’m not alone here. Thanks for the challenge on Building a blog. Unfortunately it isn’t on my radar right now. Your posts regarding adding additional income streams HAVE resonated with me and are one of the reasons I am working on a online course that I hope to release towards the end of 2016. Makes sense. Thanks for clarifying. My point is that I don’t see my readers/commenters as $ signs. I see them as potentially interesting folks whom I could build a relationship with or learn something from or be entertained by. Thanks for buying a couple of my products! I just don’t want my site’s primary focus to be about making money online. It becomes soul-sucking if that’s the case, and I feel my writing would be less interesting as a result. I do believe the money will come eventually in anything we enjoy doing for a long enough period of time. This post gave me a kick in the but to finally address this point on my to-do list. I’m currently reviewing hosting options / checking out the information around wordpress/ creating content. I aim to launch my own site for personal branding purposes in the next 6 weeks. So since I wrote it on this highly visible blog, I have to hold myself accountable :). While the internet is amazing and provides so much information I think it is too much. In some ways I miss the old days when we weren’t consumed with our computers and smart phones. Of course I wouldn’t give it up myself. I find that I want to try to control how much I use technology and don’t think that it necessarily makes us happier. I work in a particular type of legal consulting, and would love to start my own site on the side, while I work at my current job with a consulting firm. I have so many ideas for cool, presentable content. But I know this would be problematic because my firm would easily claim the site/blog as a conflict of interest, especially if it touches on the same types of topics the firm’s work relates to, and moreover because the firm has its own publication that covers current events related to our field. Don’t know what to do, because I know I could deliver this type of content in a much cooler way. The first thing to realize is that everyone has tons of ideas, but practically no one goes out and executes on their ideas. It often takes trauma to make a change. Second, you are free to do things on your own time (before or after work). This is America! If you want to be creative, share your thoughts, start a website, you are free to do so. Obviously don’t go and poach your firm’s clients. Create your own. And even if you don’t get clients, you should still create your own website for all the other reasons above. I started FS out of the desire to share and connect w/ people during the financial crisis. Making money was never the goal while I worked. To me, it is so much fun to learn and connect w/ people. You can definitely make a successful site in a year if you have a good topic with a decent potential audience, and put in the time to do the content and marketing. With my tech background, I’ve been enjoying learning the promotional aspects of running your own sure. Personally, I’m looking forward to when my sons are a little older and I have the time to invest into Enwealthen to develop it to its full potential. Just the fact you have your site is a step way ahead of 95% of everyone. Update it when you have time, and when you’ve really got time, you can open up the engine and see where your baby can take yah! Perfect timing! My revenues for 2015 were sharply down, so I’m looking at ways to create additional revenue streams so things are diversified in case one disappears. Would LOVE to see a step-by-step guide! Poll has been removed. 94% said yes. Was looking for 95%-98% to move forward :). Writing takes a lot of time! My blog has changed my life. I completely agree with all the points you’ve made. Plus, there’s something really satisfying about creating and owning your own space on the internet. Social networks are rented property. But a website is yours. Creating from nothing is extremely satisfying! Seeing something grow from nothing might be the most satisfying part of business/work. Great job running your own site! I’ll answer in more detail in a future post. But simply through partnerships with products I believe in and ads. The key is to maintain your own voice while incorporating products you believe are helpful to your readership. Build your own products and refer other products. I’m a fairly experienced web developer and pretty fluent with the latest web tech. I enjoy building websites in my free time and now have a portfolio of 3 sites (personal, wedding, and one for a friend). The missing link for me is how to build a site that makes $100 – $1000 a month. I realize that’s a question that doesn’t have a simple answer. I think the answer is in the content. I mean, that’s why I’m on FS, right? The easy answer indeed *is* content. The problem being that content is rough, it is definitely a combination of writing and presentation, and while both of these skills can be learned I would argue that it takes practice to get any good at them. Fortunately, you can just get started for pretty cheap (website for a year and like 2-3 redirects will run you less than 200 bucks/year now… crazy cheap) and with this low barrier I’d suggest you just get started! We look forward to your beginning. Nice job having a portfolio of sites! Now I’d suggest focusing on one and really building out the product offering, whether it is content or product. A website isn’t “set it and forget it” unfortunately. You’ve got to constantly be updating the site with new things until it one day forms a life on its own. But unless you really love your vertical, keep on going becomes very hard. Content, but also promotion. A great site with no promotion will just sit there unvisited and lonely. I wouldn’t be where I am today if I didn’t start a blog back in 2005 and back then no one knew blogs could even make money, so a lot of it was about meeting folks, learning from each other, and just enjoying the process. Now, it’s relatively much easier to earn some extra cash, which never hurts! Indeed! What are some of the challenges you’ve encountered since selling your own website? How do you think people starting off now can stand out and thrive? The big challenge for me was finding something to do that I was excited about. That lasted for a few weeks, then I found something I thought could be fun and get me excited to get out of bed again. It’s the same as it always is, differentiate. Be interesting but also be authentic, don’t pretend to be something you’re not. There are a lot of people out there, you’ll connect with yours if you work at it long enough.